On June 21,2019 I'm doing what I love to honor those affected by Alzheimer’s disease. I’m participating in The Longest Day, a fundraising event to advance the care, support and research efforts of the Alzheimer's Association. I will be running from Dayton Ohio to Fort Thomas, KY, 100 miles in about a 24 hour period . To raise funds and awareness to this awful disease. 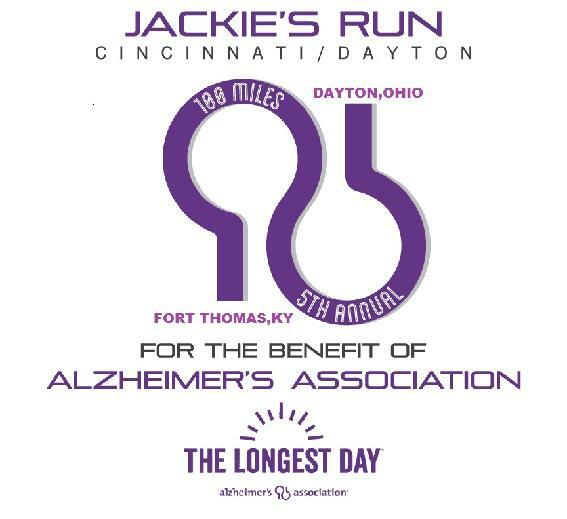 This will be my 5th annual Jackie's Run, I have ran across 5 states, Kentucky, Ohio, Florida, Rhode Island and California and over 1,200 miles for Alzheimer's.